As one of the most soulful and distinctive voices in Inspirational music today, Maurice “Man” Lauchner offers a refreshing interpretation of God’s Love through song. Maurice was born in Brooklyn, New York and raised among some of the finest singers in the area. Even as a young man, Maurice had the ability to captivate an audience with his moving sound. Maurice’s broad vocal range and acting abilities have afforded him the opportunity to touch both national and international audiences. He has lent his vocal and acting talents to “The Untold Story of Emmett Louis Till”, background vocals for Carly Simon’s “Moonlight Serenade on the Queen Mary” and as the guest character Herman on “The Cosby Show”. 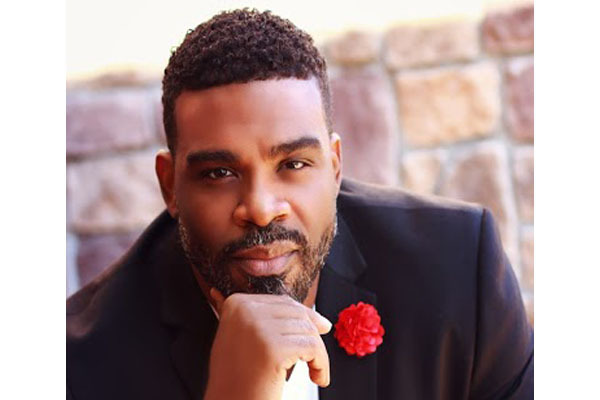 His most recent credits include Tyler Perry’s “Madea Gets a Job”, “The Haves and the Have Nots”, “Aunt Bam’s Place” and “A Madea’s Christmas”. All are presently released on DVD. He is currently on tour with “Madea on the Run”. Maurice completed his first CD “Songs & Hymns from the Heart” which is available online. He is currently working on his sophomore project. His first single from this album is entitled “I Can’t Live Without You”. It will be available for purchase this summer. Maurice’s love of music has lead him to vocal coaching and mentoring. He is available upon request. Maurice has always loved performing, but his first love is his family. He has been happily married to his wife, Alicia, for twenty years and counting. They are the proud parents of three children Todd, Maurice and Faith. Maurice: I’m originally from Brooklyn, New York. I lived in Queens for a great portion of my life. Home for me now is North Carolina. AMPS: At what age did you realize your singing and acting talents? Maurice: My family discovered my ability to sing when I was very young. I was between three and five years old. I was a teenager when I discovered my acting ability. AMPS: When and where did you first perform for a live audience? Maurice: My first performances were at home in front of the family. I was very shy in the beginning but my Grandmother helped me gain the confidence to showcase my skills. I would perform at family functions, family barbeques or just in the living room with the family gathered around. AMPS: When did you overcome your anxiety of performing in front of an audience? Maurice: Performing became more natural to me in High School. I enrolled at The High School of Performing Arts in Manhattan, more commonly known as “PA”. The movie “Fame” is based on the faculty life and specialized student training of this High School. I became more and more comfortable as I performed in front of my classes. AMPS: Who was your biggest influence and why? Maurice: Roderick Dickson, who is a former classmate, Marvin Winans, Stevie Wonder, Ella Fitzgerald and Luther Vandross are some of my biggest influences. As a teenager, I admired the tone of Marvin Winans’ voice. I began to try and develop that richness in my tone. I also trained in classical music. I have taken a little bit of all of these influences, along with a gospel edge to create my individual sound and style. AMPS: You are known for both your singing and acting abilities? Which is your first love? Maurice: I definitely enjoy singing more. But acting is a part of the overall performance of a song. A singer must convey the message of the song and tell the story behind the song. This is how a singer connects with the audience or the listener. Singing will always be my first love but I have grown to also love acting. AMPS: How did you become a part of Tyler Perry Studio projects? Maurice: I have been singing and acting for over twenty years and it has been quite a journey. I know that God has allowed each and every opportunity and he has placed me in paths to receive these opportunities. Growing up, I was cast in television shows and I traveled overseas with different productions. All of this was very exciting to me. These early experiences prepared me and propelled me to my next opportunity which turned out to be Tyler Perry. John Q. Public is not a part of your journey. They only see where you land but they don’t know the challenges along the way. There are always obstacles to overcome and disappointments to conquer. I am always thankful for where I am and what I do have. Getting married, starting my family and going into the ministry have been a huge part of where I am today. I met Tyler Perry at Maya Angelou’s 80th birthday celebration. I was performing as background vocals for Marvin Winans, The Clark Sisters, Fred Hammond, BeeBee and CeeCee Winans and Vanessa Bell Armstrong. One year later I was auditioning at his studio office. I reminded him that we had met at the birthday celebration. I decided to sing “Great is Thy Faithfulness”. I chose that song because it put everything in prospective for me. I felt that God had intervened one again. I had prayed for this opportunity and now I was standing in the midst of my prayer. I immediately called my Grandfather after the audition. I said to him “If Mr. Perry does not hire me, he will never forget me “. I was invited back to Tyler Perry Studios in Atlanta a 2nd time. Mr. Perry hired me for the play “Madea’s Christmas” on that visit. About a week later we began rehearsals. I later told Mr. Perry about the conversation that I had with my Grandfather. I thanked him for the opportunity to be part of this production. Mr. Perry told me about the conversation that he had with Mark Swinton, the Assistant Director, after my audition. Mr. Perry asked Mark, “Who is this guy and why am I not familiar with his work”? That conversation was a source of encouragement to me. It let me know that God still hears me. AMPS: You are now a solo artist. How did you make that transition? Maurice: When you love to sing and you understand your gift, you want to share that with others. I knew that I had more to give. Singing background vocals had brought me to where I was, but I was ready to step forward and become a solo artist. I had something to say, something to sing about. I stepped out on faith. Things are going well so far. AMPS: What new projects are you working on? Maurice: I’m working on the new single “I Can’t Live Without You”. It is motivational song that will encourage you to explore your relationship with God. This song will cross cultural and religious barriers. It is a message for all. I’m praying that it will get the radio air play that it deserves. AMPS: What message would you like to share with someone who needs to hear a little encouragement today? Maurice: First and foremost, I would say that God loves each of us and that his love is evident every day. We should be thankful for what is good in our lives and recognize that God has a hand in all that we do. We should realize that bumps in the road are sometimes a test of our faith. Turn it over to God and trust that he will deliver. Whatever your dreams are, stay positioned to realize them Stay patient and stay prayed up. It doesn’t always happen in your timeframe but it will happen when the time is right. I would like to thank everyone who has supported me and who continues to support me. This is fuel for me to continue my journey.